Protestant “reformers” did not have a particularly positive impact on reforming persecution. These “pillars of the Reformation” did not act like the pillars of the New Testament Church. The other ” reformers ” also were not laggards in showing their irrepressible yearning for liberty of conscience. D Aubigne, himself a most partisan Protestant, admits that at Zurich fourteen men and seven women “were imprisoned ou an allowance of bread and water in the heretics’ tower.” The Protestants of Switzerland inclosed the poor Anabaptists in sacks and threw them into the Rhine, remarking in a playful manner ” That they were merely baptizing them by their own favorite mode of immersion ” (Meuzel). Thus, the “Refomers” were intolerant and murderous persecutors. I warned about this specifically over three weeks ago (see 5 September 2010 post titled Civil War in Greece?) as I wrote, “Austerity measures in Europe will likely cause civil unrest”. World events are aligning with prophecy. There will be ups and downs in Europe until the final European beast power rises up. The protests may turn violent and this may be a major trigger for the rise of the prophesied final King of the North. Tonight at sunset is a time known as the Last Great Day. The seven day Feast of Tabernacles is immediately followed by the eighth day, which began last night at sunset. It is on that last day that those predestined in this age will be the praise to Christ’s glory to those on the earth in a way that has not happened before. 23 Then one said to Him, “Lord, are there few who are saved?” And He said to them, 24 Strive to enter through the narrow gate, for many, I say to you, will seek to enter and will not be able (Luke 13:23-24). 14 Because narrow is the gate and difficult is the way which leads to life, and there are few who find it (Matthew 7:14). So only some few will be called in this age. And there is an “age to come” (Matthew 12:32) where even infamous sinners will have an opportunity (cf. Matthew 10:15;11:22). …Adjacent to the Feast of Tabernacles, this eighth day is considered a separate Feast. Most of the small groups that observe the Feast of Tabernacles and the eight day that follows it are in basic agreement with the statements quoted from the Living Church of God. This eighth day, technically a separate feast, is called “the last day, that great day of the feast” (John 7:37). Notice what Jesus preached about on that day: “If any man thirst, let him come unto me, and drink . . . out of his belly [innermost being] shall flow rivers of living water. (But this spake he of the Spirit, which they that believe on him should receive . . .)” (John 7:37-39). Now turn to Revelation 20. After the Millennium, what happens? A resurrection! The dead stand before God. This couldn’t include true Christians today, as they will appear before the judgment seat when Christ returns. It couldn’t refer to those converted during the Millennium. They have already inherited the Kingdom during the Millennium, after living out a normal life-span. Those in this resurrection must be those who died in ignorance in past ages! They are not brought to life until after the Millennium (Revelation 20:5). This eighth day, which immediately follows the seven days of the Feast of Tabernacles, pictures the completion of the plan of redemption. It is just prior to the new heaven and the new earth. All parents and children, young and old will be resurrected. Notice that the “book of life” typifying salvation is opened (Revelation 20:12). Revelation presents the final view of the “judgment day” as the present material heaven and earth are perishing and the faithful are receiving their eternal reward at the throne of Christ. The wicked those who disobey are seen perishing in the lake of fire! What a marvelous plan! All will have an equal opportunity (Armstrong HW. Pagan Holidays–or God’s Holy Days—Which?, booklet). Isaiah prophesied how long the White Throne Judgment period would last. During this time Christ and the resurrected saints will rule. It is the time of the second resurrection. The earth will be as peaceful and productive as the Millennium itself. Children who died will live again for one hundred years, building character through the power of God’s Holy Spirit. Older people who had died without knowing God’s plan for them will also be resurrected to live for one hundred years. The close of the one-hundred-year White Throne Judgment is pictured by John in Revelation 20:11-12…100 years of testing…Isa. 65:20. (Bible Correspondence Course, Lesson 39. 1954, 1965 Edition). A major reason that I became part of the old Worldwide Church of God and now the Living Church of God is that in addition to proving all things from the Bible, I truly believe that since “God is love” (1 John 4:16) that He has a plan of salvation that will ultimately result in everyone being called and nearly every one who ever lived being saved. Two must read articles to demonstrate the truth of those doctrines are Hope of Salvation: How the COGs differ from most Protestants and Universal Salvation? There Are Hundreds of Verses in the Bible Supporting the Doctrine of True Apocatastasis. The Feast of Tabernacles is close to ending for 2010. As many who are readers of this page at this time are not at the Feast of Tabernacles now, I thought a series on the sites we attended might be of interest. This is part three of the three-part series. In 2007, we went to Crown Point, Tobago. Tobago is a small island and is part of the country known as Trinidad and Tobago. At family day, two of our sons joined with the local church brethren to play cricket. I gave two or three sermonettes there. 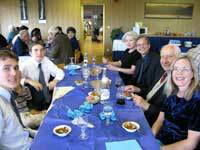 In 2008, we went to Evian, France and I gave one sermonette (in English of course). 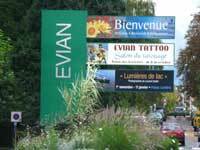 In Evian, most LCG members stayed in the same complex and normally had our meals together. In 2010, we went to Panama City, Florida for the feast–which is where we should be today. 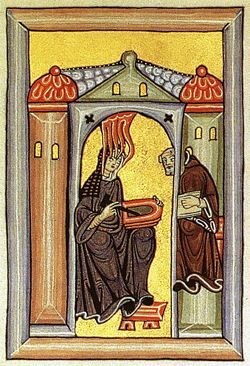 “As always happens in the life of true mystics, Hildegard, too, wanted to be subject to the authority of wise persons to discern the origin of her visions, fearing that they were the fruit of illusions and that they did not come from God,” the Pontiff noted. Hildegard, who died in 1179, is a somewhat of odd one to praise as some of her visions seem to be opposed to Bible prophecy. Yet, the Bible does not teach that Antichrist “make the earth move, level mountains, dry up rivers, produce thunder and lightenings and hail”. The Bible teaches that God will have this done during the Day of the Lord (Revelation 16:12, 17-21). Yet, because the Bible shows that God will resurrect everyone else after the millennium (Revelation 20:5,13), this is certainly something that we would expect Jesus to teach. This is not a doctrine or Antichrist. Jesus, of course, practiced the “Jewish” religion, but the way that God, not certain rabbis, intended for it to be practiced. Catholics need to understand that some prophets who have called themselves Catholic (such as Hildegard) are really warning against the returning Jesus Christ, and are referring to Him as Antichrist. Please do not be taken in by that. And fly from those who linger in caves and are cloistered supporters of the Devil. Woe to them, woe to them who remain thus! They are the Devil’s very viscera, and the advance guard of the son of perdition. It would appear that the mystic was demonically-influenced as she is actually warning against supporting the true Philadelphian pacifist Christians (something that may happen, as some might try to join them per Isaiah 56:8). It is the Philadelphians who will be protected, yet she seems to be claiming that they are the “supporters of the Devil” (probably because they will oppose the final revised ecumenical church and because that church will have persecuted them). Because she calls them “the advanced guard of the son of perdition,” she apparently refers to a group of people who will be protected in caves just before Christ returns. Notice also that she specifically warns against religious people in caves who are miraculously fed. Yet she must not have realized that the Bible indicates that those who receive God’s protection in the wilderness during the end time (Revelation 12:14–16), and are in caves (Jeremiah 48:28), are His people (Isaiah 16:1–4 in Sela/Petra), will be religious (Revelation 14:12), and will be miraculously fed (Isaiah 33:15-16). Hence, the above vision does indicate that even the demons have known about a place of protection where some people will be miraculously fed, for quite some time. However, those associated with the King of the North will then turn their attention to the rest of her seed, the non-Philadelphian Christians (which will be a “secret sect,” but will try to remain hidden, most likely, to avoid this persecution). Early Catholic leaders such as Irenaeus, Hippolytus, and Cyril also believed this. Hence Hildegard is once again not even faithful to Catholic positions on prophetic matters. Bishop St. Victorinus (2nd century): But the woman fled into the wilderness, and there were given to her two great eagle’s wings…to that…church…let them go to that place which they have ready, and let them be supported there for three years and six months from the presence of the devil. Thus, the idea of true Christians fleeing, being supported, and being away from the devil for 3 ½ years is consistent with both biblical and certain Catholic teachings. No one should rely on Hildegard’s false admonition. The Greek Orthodox tend to believe that the faithful will flee to caves in the desert/wilderness for 3 ½ years. Yet, Hildegard is being praised as a “true mystic”. Perhaps I should point out that she wondered if her visions were of demonic source at times. I suspect that many were. Hildegard professed positions that were apparently opposed to biblical and certain Catholic understandings of end time events. Essentially, what the survey says is that atheists and agnostics often have studied religion more than many who claim some type of religious faith, hence they know more than many who profess belief in God do. Specifically, the survey from the Pew Forum on Religion & Public Life found that a majority of Protestants did not know that Martin Luther was the driving force behind the Protestant Reformation and that 40% of Catholics did not understand their teaching on communion known as transubstantiation. I have found that many in Southern California really do not understand the doctrines and history of the Catholic and Protestant faiths. The reality is that much of what passes for Christianity does not have basis in the Bible, hence it is of little surprise that many have become somewhat agnostic towards religion. Furthermore, while Catholic and Protestant scholars are fully aware that early Christians would not war, current Catholics and Protestants generally feel that military warfare is acceptable for modern Christians. But Jesus taught a different way. Posted in Prophecy, Religious News | Comments Off on What is Going on with the Russian Orthodox? As many who are readers of this page at this time are not at the Feast of Tabernacles now, I thought a series on the sites we attended might be of interest. This is part two of three. In 1990, our family went on the Mediterranean cruise for the Feast of Tabernacles. Over one thousand attended. This cruise began in Venice, Italy, went to Greece, and to several of the churches of Revelation 2 & 3. This was the first time we had visited any of those Churches, and since my wife and I have visited them all. In the 1990s, there were over 100 feast sites pretty much every year, and thus we tended to have a lot of choices about where to attend. Though even now, the Living Church of God has over 40 sites. Perhaps I should add that leaders that Christians consider to be saints such as the Apostle Paul and Polycarp of Smyrna kept the Feast of Tabernacles. It is an interesting game and Michael is always adding more questions to it. The game now has around 1,000 different questions. Think of it as an entertaining way to assist your doctrinal memory. Besides, the Bible teaches that there is a “time for every purpose under heaven” (Eccl 3:1). Hence, there are new items, games, and other materials than simply doctrinal and prophetic ones at the www.cogwriter.com website. While nearly everyone is familiar with the Catholic persecutions during the Inquisition, many are unaware of the persecutions by the early Protestants. As one raised Roman Catholic, I was aware of the fact that the Protestants were involved in persecuting Catholics, but did not realize until much later the extent of Protestant persecutions. Now I would like to point out that there is no evidence that there ever was any organized persecution by the Church of God. Those truly in the COG were often persecuted and never the persecutors. I, Martin Luther, slew all the peasants in the rebellion, for I said that they should be slain; all their blood is upon my head. But I cast it on the Lord God, who commanded me to speak this way (Werke, Erl. Edition, lix, p. 284 ‘Table Talk’ as quoted in Stoddard JL. Rebuilding a Lost Faith, 1922, p.96). It is reported that 100,000 perished at that time. The persecution of the Anabaptists by the “Reformed ” Church is another dark stain upon the character of the Reformation…but no mere belief ever deserved torture. They had one redeeming trait, however—the rejection of Lutheranism and the authority of Luther. This was their chief crime, although their rejection of infant baptism, and their protest against any other form of baptism but by immersion, was an argument which weighed heavily against them with the Lutherans, and one to be suitably answered only by extermination. Article XVI: Of Civil Affairs. Of Civil Affairs they teach that lawful civil ordinances are good works of God, and that it is right for Christians to bear civil office, to sit as judges, to judge matters by the Imperial and other existing laws, to award just punishments, to engage in just wars, to serve as soldiers, to make legal contracts, to hold property, to make oath when required by the magistrates, to marry a wife, to be given in marriage. They condemn the Anabaptists who forbid these civil offices to Christians. Thus, intolerance and persecution came from the followers of Martin Luther. You are currently browsing the Church of God News weblog archives for September, 2010.